/ Features / Opinion / Motor City Blogman / Is the Woodward Dream Cruise the Future of Driving? 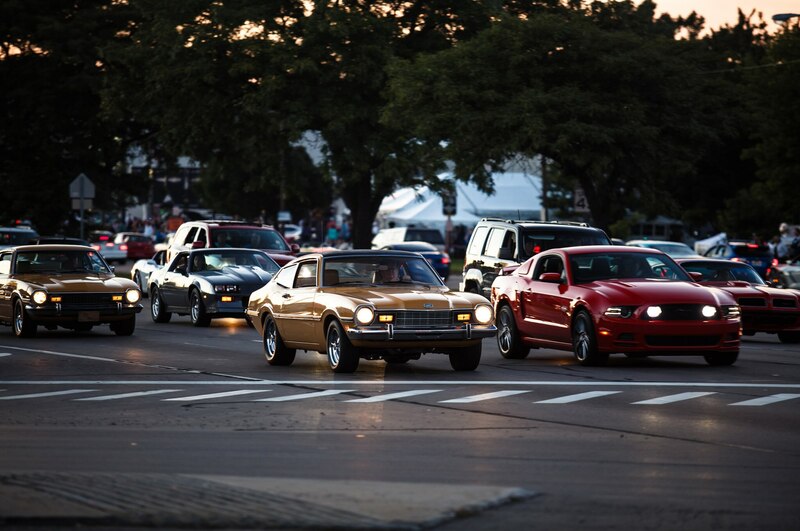 Is the Woodward Dream Cruise the Future of Driving? Illustration courtesy Gibbs Planning Group. Every third Saturday in August, about 40,000 classic muscle cars, sports cars, space-age family prairie schooners, pickup trucks, and assorted automotive jetsam and flotsam clog Woodward Avenue in Royal Oak and Birmingham. Their owners hope to drive the cars fast enough to keep 30- to 65-year-old engines from overheating, and some even sneak in an illegal burnout. Mostly, the drivers are lucky if they reach 15 miles per hour between stoplights as they loop from northbound to southbound and back again along the eight-lane boulevard. The heart of the Woodward Avenue Dream Cruise is roughly 4 miles between 12 Mile Road and Maple Road. Officially, the world’s most popular traffic jam starts just south of 9 Mile in Ferndale and has a separated contingent another 15-plus miles north in Pontiac. This year also marks the second year of the CruisIN’ the D’, a cruise event that takes place south of 8 Mile Road in Detroit, offering the predominantly black community an alternative to the mostly white gathering in the suburbs to the north. The Dream Cruise has been one of metro Detroit’s biggest tourism draws for 20 years, held on a 27-mile-long road with a history that predates the advent of the automobile. It seems an antidote to the way the personally owned and driven automobile is losing eminence among America’s transportation choices. Urban planners are redesigning cities and major metropolitan areas to be friendlier to pedestrians and bicyclists, amid ever-worsening traffic and as many millennials choose not to own cars, as Uber and Lyft and their ilk edge out traditional taxicabs. Even Los Angeles has improved its mass transit system, making the Missing Persons’ hit “Walking in L.A.” more of a relic than its ’80s vintage suggests. Can the Motor City mimic L.A.? The nonprofit Woodward Avenue Action Association is giving it a try. Thirteen years ago, the association lobbied the U.S. Transportation Department to designate Woodward the nation’s first “All-American Road,” as part of its work to identify and designate local landmarks. 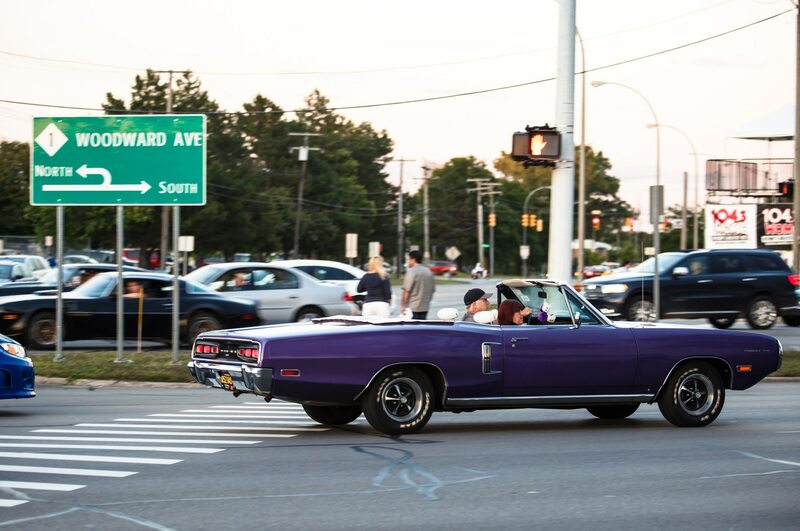 All summer long, cruisers and spectators, including the estimated 1.5 million who make it to the Dream Cruise, can see All-American Road signs up and down Woodward Avenue. Thirteen years from now, if the Woodward Avenue Action Association gets its way, the 27-mile road will look much different than it does now, with bicycle lanes, better pedestrian access, and rapid-bus lanes, and perhaps even a light-rail system elbowing for space with personal cars and trucks. 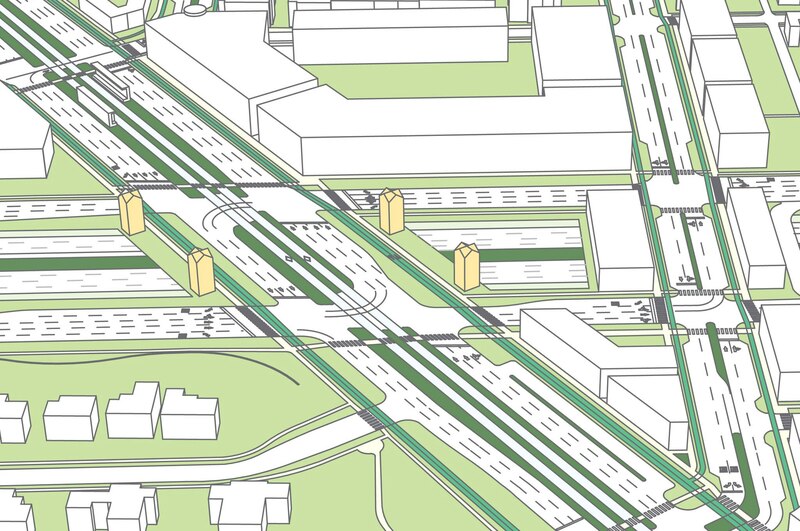 The master plan even calls for reconstructing a freeway underpass at Interstate 696. “We have gotten incredible support,” says Deborah Schutt, executive director of the Action Association, whose Complete Streets plan gets underway this September with bike lanes up and down Woodward Avenue between 6 Mile Road in Detroit and I-696, at 10 Mile Road, in the bedroom community of Pleasant Ridge. The short-term plan, she says, is to “test out” the bike lanes, to be marked temporarily with orange barrels, “then do it incrementally.” The group expects to put the 15-year master plan to a vote on the November 2016 ballot. Woodward Avenue, which for the last century has been the poster road for our automotive culture, could now become the model for a balanced mix of transportation modes. The proponents of the Woodward Avenue master plan, including the urban planner who drew it, don’t want, nor do they expect, the car to go away. Robert Gibbs doesn’t expect rapid buses, with their stoplight-changing devices, or potential expansion of the M1 light-rail system that’s now being constructed to disrupt future Dream Cruises. “You can definitely accommodate the cruise,” says the principal of Gibbs Planning Group, the Birmingham, Michigan, firm that has consulted with cities from Santa Cruz, California, to Chicago to Charleston, South Carolina, on how to transform urban neighborhoods into more pedestrian-friendly places. The short-term plan would have rapid-bus lanes using the now-grassy median along most of Woodward Avenue. The buses could shuttle residents of the tony suburb of Birmingham to see a Lions, Tigers, or Red Wings game, some 18 or 19 miles south, in just 15 minutes, he says. Gibbs Planning’s 15-year plan for Woodward Avenue also considers the possibility of extending Detroit’s M1 rail north into the suburbs of Ferndale, Pleasant Ridge, Royal Oak, and Birmingham, and potentially beyond. So far, the M1 light-rail system plan calls for connecting just 3.3 miles of Woodward Avenue from downtown Detroit to the New Center area, near the former General Motors headquarters. (Before you get up in arms over Detroit’s post-bankruptcy spending, more than $95 million of the project’s $140 million budget comes from private corporations and foundations, with the feds, Wayne State University, and Detroit Medical Center kicking in another $43 million.) It’s scheduled to begin service in early 2017. Replacing the rapid transit buses with light rail would raise property values, especially for offices close to the streetcar stops, Gibbs maintains. He doesn’t think the rapid buses or light rail will disrupt suburban Detroit’s summer cruises on Friday and Saturday nights, though he concedes that on Dream Cruise Saturday, the mass transit schedule might have to be altered. For the past two decades, the cruise has prompted many of the nearby businesses not connected with automobiles (or food) to shut down for cruise weekend. Dream Cruise volunteer president Greg Rassel thinks such mass transit could be a boon for the event. As it stands, too many modern minivans and midsize sedans full of spectators mix with the classics on the Saturday Dream Cruise route. For 20 years, the Woodward Avenue Dream Cruise has been a sort of anachronism, even in metro Detroit. Lots of young people come to see the cars their parents and grandparents lusted over, and many of those young enthusiasts will buy or inherit such classic iron and continue to take them for cruises along Woodward Avenue on warm Friday and Saturday nights. But their daily transportation will probably be something much different than what we’re used to now. 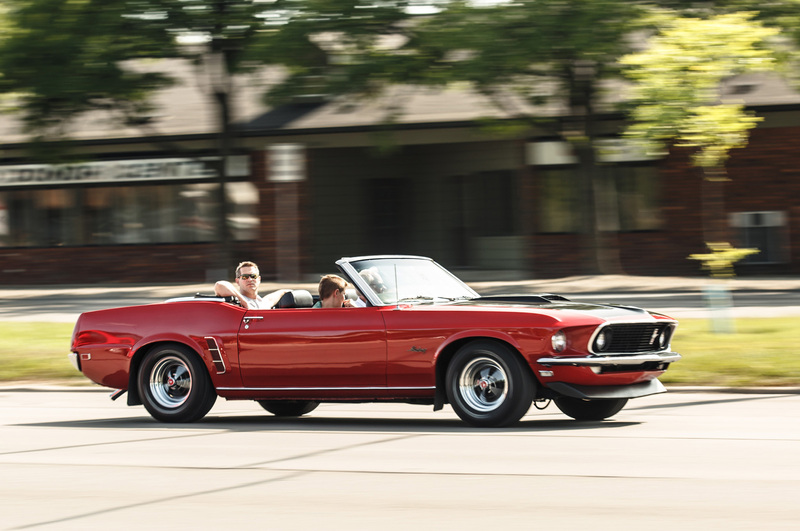 As daily transportation choices change and the boulevard evolves into something more welcoming to non-drivers, the summer cruise nights are transforming into a curated rolling auto museum.